Today’s rubbish is a mix of bits and pieces recovered from my garden, which has a tendency to catch the packaging from the playing fields at Hardenhuish and Sheldon Schools, and litter found while out and about in John Coles Park. People are unaware of the new £150 fines. There aren’t enough bins / bins aren’t where people use them. Brighter bins would make it easier to find them (indeed, from the centre of John Coles Park it was difficult to see the green bins against a green background). The idea of a deposit return scheme was enthusiastically received, especially with a redemption value of 20p. Finances seemed to be the biggest motivator for not littering (threat of a fine / ability to get money back). One teen commented that rubbish goes into the ocean and kills fish, but didn’t think litter on land was a problem for wildlife (it is). 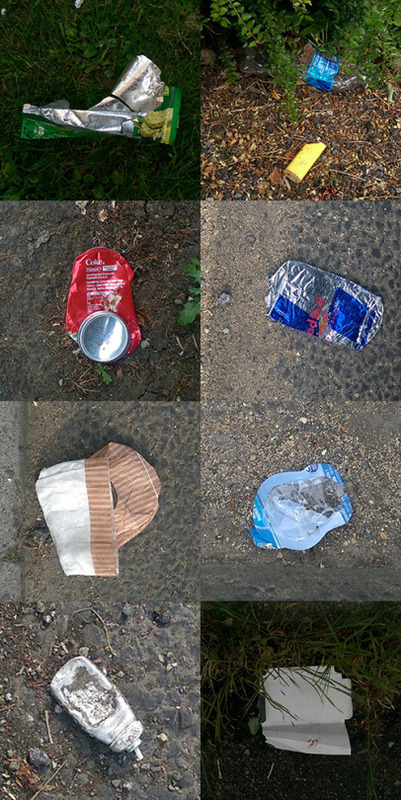 One person made an offhand comment about litter making a job for people. This is a persistent attitude that needs to be directly addressed: the money spent on litter cleaning could go to other things and pay the salary of those solving problems we do not cause ourselves. Watch this space for more #OneADayInMay updates, as well as more results from our questionnaire.